One of the most highly requested types of posts has been back to school kinds of things like my school supply essentials, backpack picks, must haves for tennis, etc. Today I'm kicking off this little series with something that is near and dear to my heart: my pencil case! I have kind of a problem when it comes to pencil cases... Ever since middle school I've been obsessed with finding the perfect one and have probably collected over 10 different ones over the years. They are so personal, lugged around in my backpack and used everyday so it's very important to pick one that is practical, large enough and most importantly, super cute! After searching for a while and realizing that I'll need a bigger one this year that will be able to fit my calculator (my TI-89 will become my best friend I hear), I finally found the best one from Scout. The 3-way cosmetic bag is at the best price point ever for how precious it is (only $22! 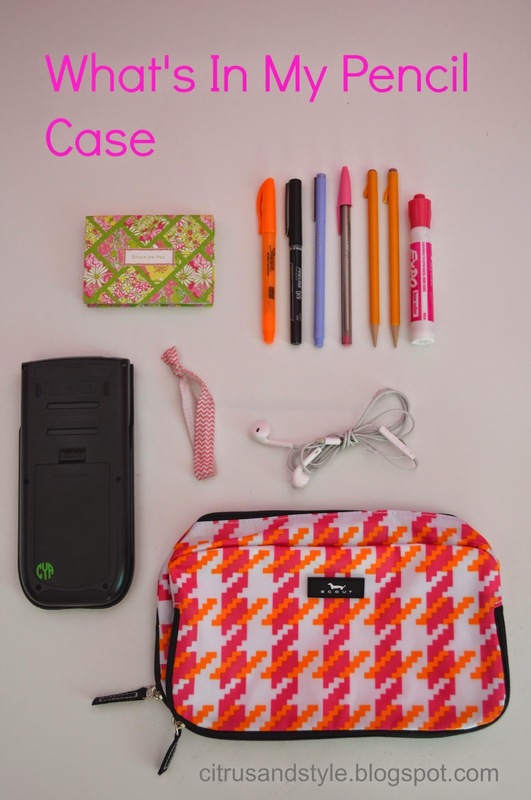 ), not to mention it has 3 pockets with lots of storage space for my ear buds, calculator and large collection of writing utensils. And how cute is the pink and orange houndstooth?! See what I keep in my pencil pouch below! sticky notes: You never know when you'll need to write yourself a note on an assignment, on a page in your textbook or to leave for a friend. Why not find some cute ones like these from Lilly Pulitzer? pens + pencils + highlighter + dry erase marker: I like having at least one highlighter, dry erase marker and black pen along with several pencils and colored pens for color coding notes and my agenda (stay tuned for an agenda post soon!). I keep all of these in the large main pocket for easy access - it's also great because this cosmetic is lined so that pen will easily rub off. calculator: Even though this TI-89 we are required to have only comes in black, I dressed it up with a fun little monogram. I have designated one zippered pouch dedicated to my calculator to keep it safe and away from any exploding pens or highlighters. hair band: My worst nightmare is having to scramble while writing a paper or taking a test with my hair all in my face. This is the cutest hair tie ever and I really recommend keeping one because you'll need it more than you think. ear buds: Since almost all of my documents and assignments are online, having a nice pair of earbuds in my pouch is crucial. I slip them in the third pocket with my post its and hair band in case I would need them to watch a video or listen to music. Is it bad that writing this post has gotten me kind of excited for school? Only 1 week until my first day! Now I really want to hear your input: what kind of pencil case do you use? Such a great post! I used to have a huge pencil case with a million things in it, but it always got so heavy so I switched to a tiny one that only holds the essentials (two pencils, two pens, and a highlighter). I love the fun pattern on your case! ah! you reminded me that I need (or want..whatever) a new pencil pouch! I have a sick collection of them, but I just can't stop buying more! I don't think there are lots of kids excited for school as you are - good on you! That pencil case is pretty, too.